Above is the final painting I created for the US Air Force. 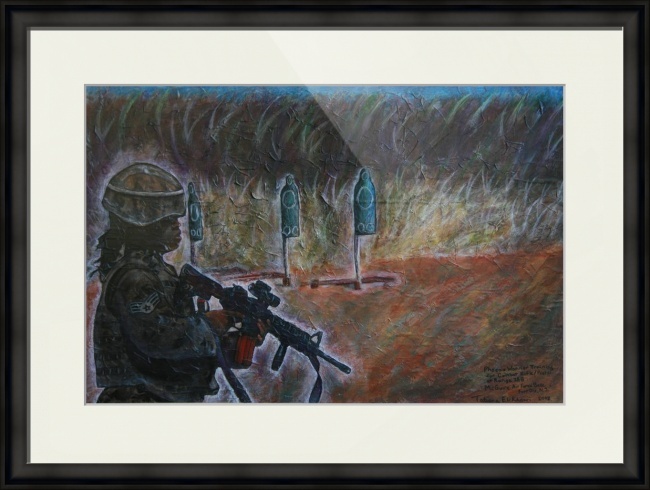 It was presented at the Air Force Art Gala in Washington DC at Bolling Air Force Base along with 150 talented artists. Visiting the Nation’s capital and being among so much history made me very proud of my artistic contributions to the country and its brave servicemen and women. I’m writing today to say, “Tag, You’re It!” You don’t have to participate but here’s what it’s about. As it was put to me, “Don’t know who started this tag game but here goes. This is a good thing. It helps spread the word about your blog, and you get some pretty entertaining information about other artists. hey, nice work. i have heard about this program/oppoturnity. is it a one time gig to go and do drawings of soldier’s training? where can i find more info?